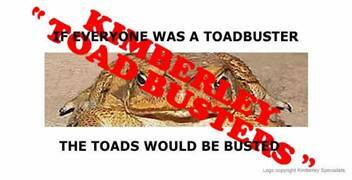 KTBs start toadbusting and training. Cane toads reach Victoria River Roadhouse. Border divides mean nothing to East Kimberley community groups wanting to help Northern Territory landowners fight the cane toads off their land. “The Kimberley Community is not prepared to accept governments’ self fulfilling prophecy that there is nothing we can do to stop the cane toad from crossing into Western Australia ” said Dean Goodgame of Kimberley Specialists . Investigation from boats of cane toads on the banks of the Victoria River both East and West of Timber Creek. “We are still waiting for governments to catch up with the community but the cane toads are not, and the first early rains for the wet season have arrived. The Kimberley is running out of time to contain cane toad populations in dry season billabongs and other aquatic systems. We need to undertake an immediate strategy of attack that will enable government and community volunteers to assess just how we ‘stop’ the cane toad front from crossing into the Kimberley in 2006, ” said Lee Scott-Virtue. Kimberley Specialists in Research has the volunteers army signed up, with the help of Northern Frogwatch knows approximately where the toad front and incursions are, and has received invitations onto NT Lands. However, we are a volunteer group relying heavily on local donations. We URGENTLY need resources for our volunteers, including fuel and vehicles, traps, nets, torches, gloves, bags and freezers. Little if any, on ground help has been forthcoming from government, so we will be on our own at the front again on the first October weekend doing what we have to and paying for it ourselves. “After Kimberley Specialists remarkable Cane Toad Forum held in Kununurra in March 2005, which brought all the cane toad scientists and experts together, resulted in the listing by the federal government of the cane toad as a Key Threatening Process to the Nation, the establishment of the Stop The Toad Foundation and a government commitment of $500,000 to the community, there has been a deafening bureaucratic silence about the urgency that energises the Kununurra Community,” bemoaned Lee Scott-Virtue. “What seems to be happening is an overwhelming focus on all agencies involved, government and non-government, to work at being perceived to be working together, rather than actually acknowledging that they are so under-resourced that there is actually very little work actually happening on the ground”, said Lee . The toads which managed to find themselves a water source and survived the present dry season have matured to wreak havoc with their eggs. These surviving water sources are at their minimum Now and so are the surviving toads. Rain is Coming and if the eggs are laid in great numbers, then the real chance of resisting this years’ spread across the Victoria River into the Kimberley will be lost and the spread just that much harder to contain next year. WE JUST NEED RESOURCES FOR OUR VOLUNTEERS!!!! THE TOADS WOULD BE BUSTED!! !